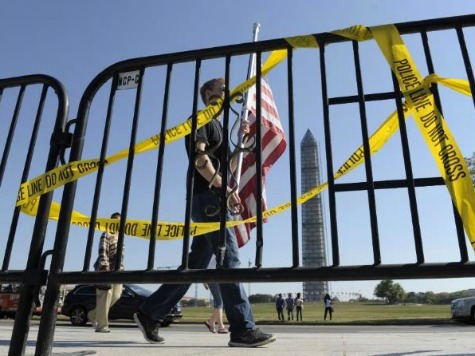 Newly released public records show that the Department of the Interior knew in advance that two groups of aging veterans would be visiting the World War II Memorial on October 1, 2013, but they decided to barricade the premises anyway. According to emails obtained by National Review Online, the U.S. National Park Service employees were also constantly monitoring the news for any negative media attention. Moreover, the emails show that government shutdown exceptions were granted to National Park Service employees. The Obama administration tried to make political hay out of the government shutdown by closing the National Mall and denying access to monuments, but the decision backfired when the veterans defied the signs and fences and entered the WWII Memorial. The vets were taking part in the Mississippi Gulf Coast Honor Flight, established in 2011 to help fly the state’s WWII veterans to Washington, D.C. and to provide tours to monuments dedicated in their honor. Obama told the American people that it was necessary to shut down the Mall and blamed Republicans for creating the hardships. However, the emails reveal that the Department of the Interior and National Park Service did not have to shut down the monuments but did so to make a point. While I understand that these memorials have remained accessible to the public during past shutdowns (I’d imagine with the mall being so open, it’d probably [be] more manpower intensive to try to completely close them), I wanted to do my due diligence and make 100 percent sure that people could visit the outdoor memorials on the National Mall in the event of a shutdown.